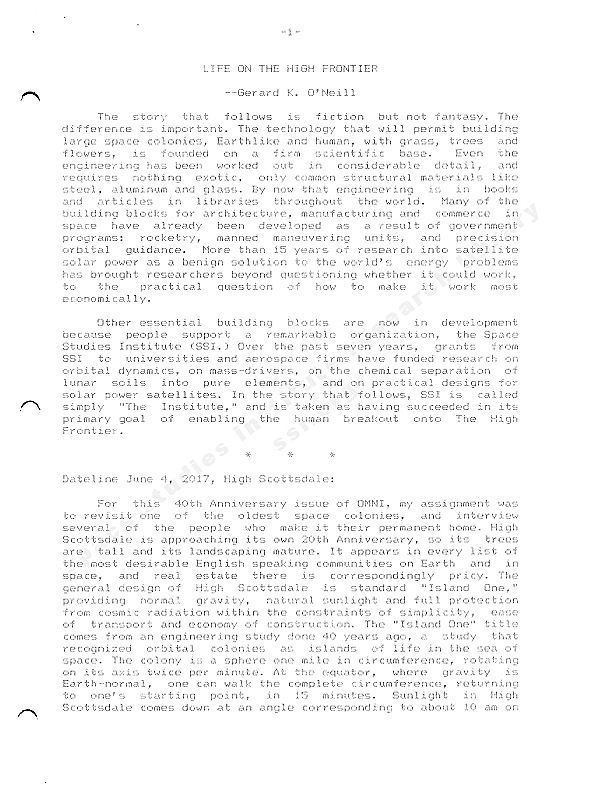 For many years, OMNI Magazine was the jewel of popular Science and Science/Speculative Fiction periodicals and the Space Studies Institute had quite a relationship with the magazine – SSI CoFounder Gerard K. O’Neill did interviews and wrote articles and OMNI’s legendary Founder and President Kathy Keeton sat on the SSI Board of Advisors. 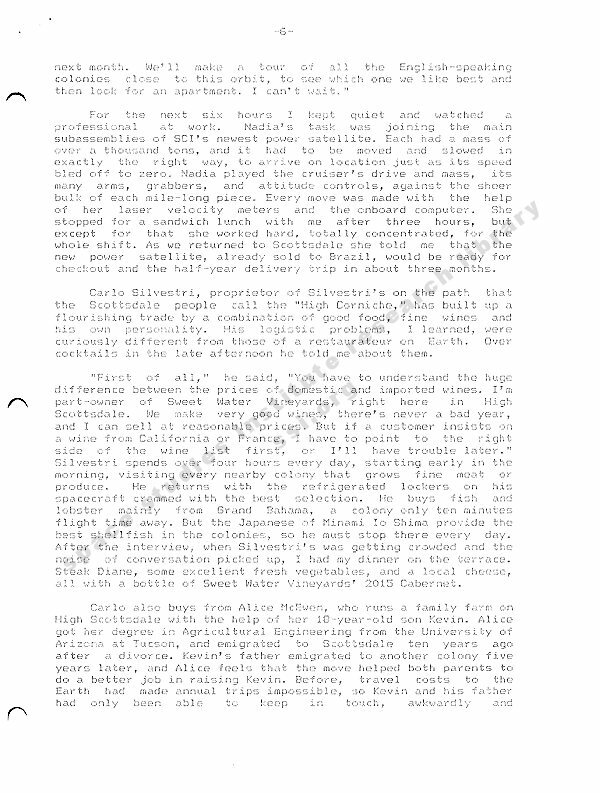 In the October 1984 “Life in the 21st Century” issue, O’Neill contributed the piece “The High Life In Space.” You can now read that again as it appeared in OMNI thanks to a new company, OMNI Media, making all of the old issues available in high quality color Kindle format on the Amazon.com site for a small price. 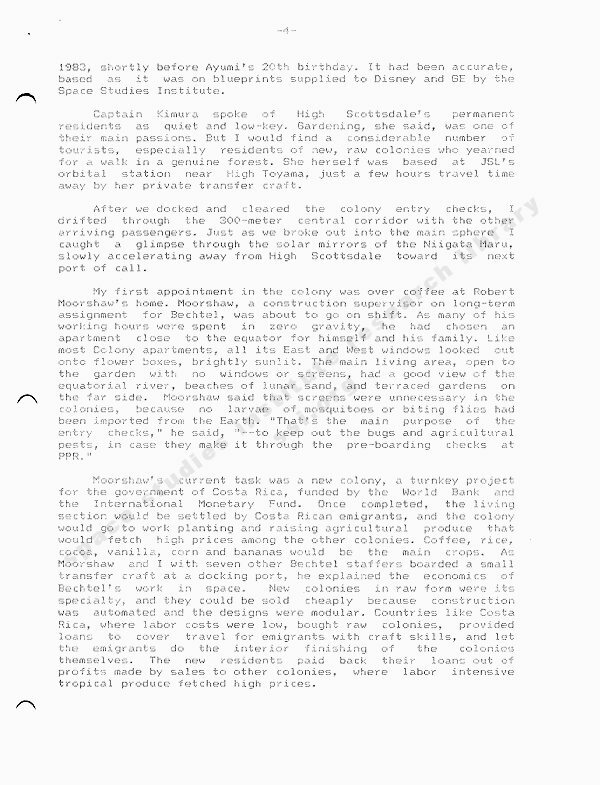 Right here, you can now read the original draft version “Life on The High Frontier”, straight from Gerry’s dot-matrix printer. Why bring this out of the SSI vault today? The story that follows is fiction but not fantasy. The difference is important. The technology that will permit building large space colonies, Earthlike and human, with grass, trees and flowers is founded on a firm scientific base. Even the engineering has been worked out in considerable detail and requires nothing exotic, only common structural materials like steel, aluminum and glass. By now that engineering is in books and articles in libraries throughout the world. Many of the building blocks for architecture, manufacturing and commerce in space have already been developed as a result of government programs: rocketry, manned maneuvering units and precision orbital guidance. More than 15 years of research into satellite solar power as a benign solution to the world’s energy problems has brought researchers beyond questioning whether it could work, to the practical question of how to make it work most economically. Other essential building blocks are now in development because people support a remarkable organization, The Space Studies Institute (SSI). Over the past seven years grants from SSI to universities and aerospace firms have funded research on orbital dynamics, on mass-drivers, on the chemical separation of lunar soils into pure elements, and on practical designs for solar power satellites. In the story that follows, SSI is called simply “The Institute,” and is taken as having succeeded in its primary goal of enabling the human breakout onto The High Frontier. For this 40th Anniversary issue of OMNI, my assignment was to revisit one of the oldest space colonies and interview several of the people who make it their permanent home. High Scottsdale is approaching its own 20th Anniversary so its trees are tall and its landscaping mature. It appears in every list of the most desirable English speaking communities on earth and in space, and real estate there is correspondingly pricey. The general design of High Scottsdale is standard “Island One,” providing normal gravity, natural sunlight and full protection from cosmic radiation within the constraints of simplicity, ease of transport and economy of construction. The “Island One” title comes from an engineering study done 40 years ago, a study that recognized orbital colonies as islands of life in the sea of space. The colony is a sphere one mile in circumference rotating about its axis twice per minute. At the equator, where gravity is Earth-normal, one can walk the complete circumference, returning to one’s starting point, in 15 minutes. Sunlight in High Scottsdale comes down at an angle corresponding to about 10 am on a Spring or Autumn morning. At dusk it dims slowly to the vanishing point, as the shutters gradually close according to the twilight schedule. Enough light gets through to make the nighttime scene in the park areas about as bright as a moonlit night on Earth. The lights from homes, restaurants and along walkways are all visible from nearly everywhere inside the sphere, so in my week’s visit I never found a night as dark as we have on earth. It’s quiet in High Scottsdale because there are no cars or planes there — the scale is small enough that people walk on winding foot paths bordered by flowers, or ride bicycles on lanes built for them. High up, where the corresponding hills are steep, many of the footpaths have steps, like those of the mountain villages in Italy or Southern France. The largest vehicle I saw was a building contractor’s truck and it was an electric powered van not much bigger than a golf cart. In the quiet, the loudest sounds one hears are voices and music, and the songs of birds. High Scottsdale was built to circle the Earth a little closer to us than the Moon, giving it a 3-week orbital period. That orbit was chosen to give the colony easy access to the first manufacturing complex built by Solar Consortium International. Even now most of the people from High Scottsdale that work outside it commute to one of SCI’s facilities, and after nearly 20 years of employee stock option plan operation, a significant fraction of SCI stock is in the hands of High Scottsdale residents. They’ve seen their earliest investments in SCI multiply over 400 times in those years. No wonder, considering that in the 2015 World Survey more than 25% of the Earth’s electric power turned out to be coming from antennas fed by solar power satellites built by SCI. Competition from Tokyo Sun Power Limited and the Kosmograd Dynamo Collective is stronger every year, but SCI still benefits from its own head start. Now that we have the four major spaceports of the Earth, each close to the Equator and each with a land-free safety zone thousands of miles long down range of it to the East, supersonic aircraft — the boomers — have finally come into their own. And the airport identifiers for the spaceports, PPR at the Peter and Paul Rocks off of the Brazilian coast, MIS for the Maldive Islands atoll, AWP for the Admiralty Islands site, and EPS for the Eastern Pacific spaceport that serves our West coast, are as familiar to us as JFK and LAX. My boomer trip at 60,000 feet from New York to PPR was routine. As always, there was construction at PPR: runway extensions for the boomers, new launch complexes for the shuttles, and hotels for the transit passengers who arrived early so as not to miss connections. The Peter and Paul Rocks are totally hidden by the new buildings. My shuttle flight was in one of the new Boeing 7007’s, a fully reusable machine. Like the old Concorde, it holds only 100 passengers. Accommodations are spartan, like the jumbo shuttles, with a thin fabric bunk in a small flat screen TV for each passenger. After all, the ride is only 20 minutes to orbit. I could feel distinctly the cut off of the kerosene rocket burn, the moment of zero gravity and then the gentler thrust as the dual-fuel engine switched over to burning hydrogen. My first interview came on the long two day trip from the transfer station to High Scottsdale. I made the voyage on the Niigata Maru. Once the transfer orbit burn was over the captain, Ayumi Kimura locked the controls and opened the doors to the bridge so that we could visit and talk with the crew on watch whenever we liked. Captain Kimura has been with JSL over 15 years, having transferred from a career of piloting 767’s for JAL before that. Though Captain Kimura’s permanent home is in High Scottsdale, she also has a summer place near Sapporo on Japan’s northern island. We met during the Captain’s Supper on the first evening of the voyage, and she told me something of the logistics of space travel within the Inner System. The critical discovery, made in 1988 by a robot spaceprobe, was deposits of water ice and carbonaceous material in the permanent shadows within deep craters near the lunar poles. The survey teams are still prospecting and no one can estimate within better than 50% just how much of the stuff there, is but the total is well over a billion tons. Theories from as early as the 1960’s had predicted the deposits, but only from the reflections of galactic x-rays picked up by the space probe was it possible to make certain that the material was there. As Captain Kimura explained it, carbon, nitrogen and hydrogen, three of the elements essential for life, are very rare over most of the Moon. They were baked out by extreme heat early in the history of the solar system. Once the deposits of meteoric carbon, nitrogen and hydrogen preserved in the shadowed craters were found and mined, it was relatively easy to combine them chemically into crude plastics. That plastic was made into spheres about the size of baseballs, just the right size and weight to be catapulted into space by the lunar mass drivers of the early 1990’s. At the processing plants in space, the plastic was ground into a soil mix that plants could grow in and live on. That accounts for the tall trees and the rich vegetation of High Scottsdale and its sister colonies. 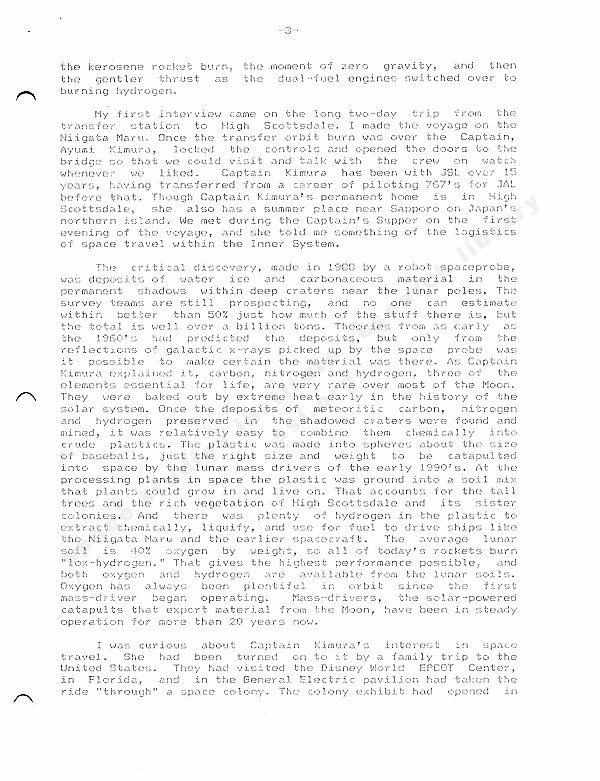 And there was plenty of hydrogen in the plastic to extract chemically, liquefy, and use for fuel to drive the ships like the Niigata Maru and the earlier spacecraft. The average lunar soil is 40% oxygen by weight so all of today’s rockets burn “lox-hydrogen.” That gives the highest performance possible, and both oxygen and hydrogen are available from the lunar soils. Oxygen has always been plentiful in orbit since the first mass-driver began operating. Mass-drivers, the solar-powered catapults that export material from the Moon, have been in steady operation for more than 20 years now. I was curious about Captain Kimura’s interest in space travel. She had been turned onto it by a family trip to the United States. 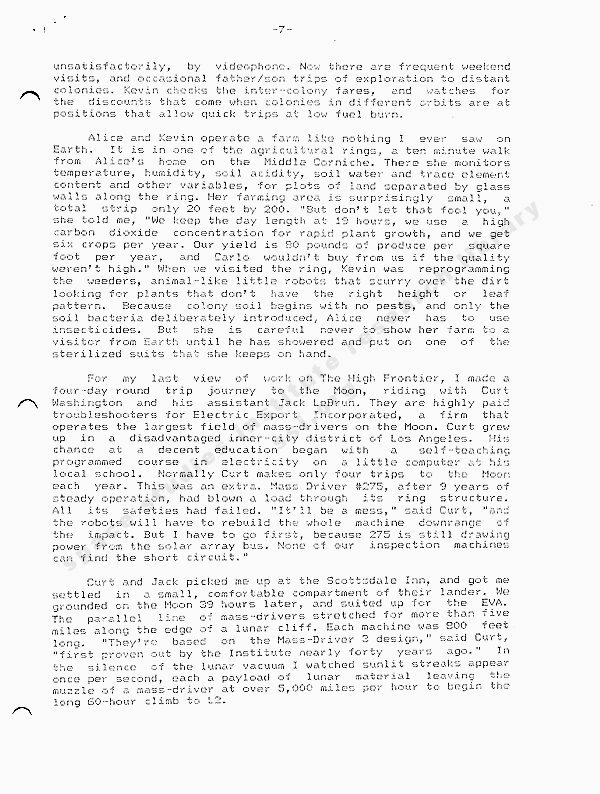 They visited the Disney World EPCOT Center in Florida and in the General Electric Pavilion they had taken the ride “through” a space colony. The colony exhibit had opened in 1983, shortly before Ayumi’s 20th birthday. 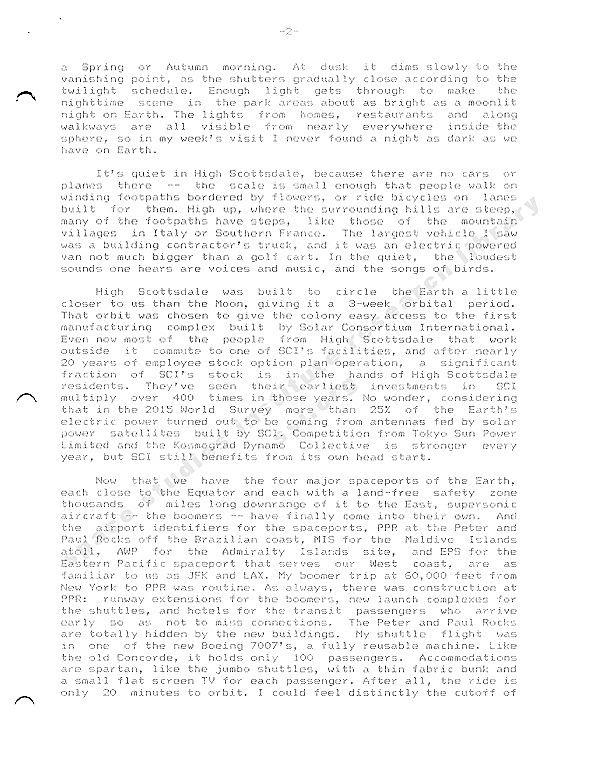 It had been accurate, based as it was on blueprints supplied to Disney and GE by the Space Studies Institute. Captain Kimura spoke of High Scottsdale’s permanent residents as quiet and low-key. Gardening, she said, was one of their main passions. But I would find a considerable number of tourists, especially residents of new, raw colonies who yearn for a walk in a genuine forest. She herself was based at JSL’s orbital station near High Toyama, just a few hours travel time away by her private transfer craft. After we docked and cleared the colony entry checks, I drifted through the 300-meter central corridor with the other arriving passengers. Just as we broke out into the main sphere I caught a glimpse through the solar mirrors of the Niigata Maru, slowly accelerating away from High Scottsdale toward its next point of call. Moorshaw’s current task was a new colony, a turnkey project for the government of Costa Rica, funded by the World Bank and the International Monetary Fund. Once completed, the living section would be settled by Costa Rican emigrants and the colony would go to work planting and raising agricultural products that would fetch high prices among the other colonies. Coffee, rice, cocoa, vanilla, corn and bananas would be the main crops. 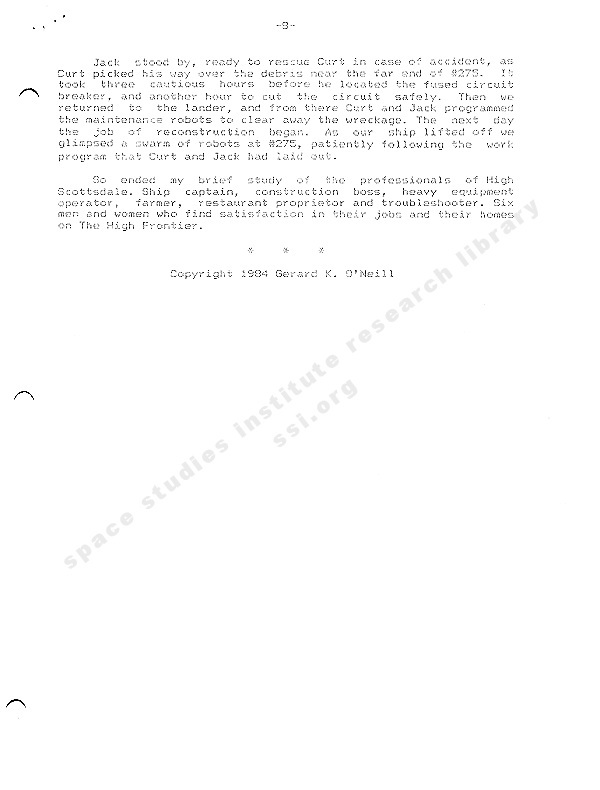 As Moorshaw and I with seven other Bechtel staffers boarded a small transfer craft at a docking port, he explained the economics of Bechtel’s work in space. New colonies in raw form were its specialty, and they could be sold cheaply because construction was automated and the designs were modular. Countries like Costa Rica, where labor costs were low, bought the raw colonies, provided loans to cover travel for emigrants with craft skills, and let those emigrants do the interior finishing of the colonies themselves. The new residents paid back their loans out of profits made by sales to other colonies where labor intensive tropical produce fetched high prices. After a 20 minute flight covering 100 miles, we disembarked at Bechtel’s construction center. A relief crew took over the consoles, the staff of the previous shift boarded the transfer craft, and Moorshaw led me to a large viewport. From there, Task 309 filled half the starry sky. 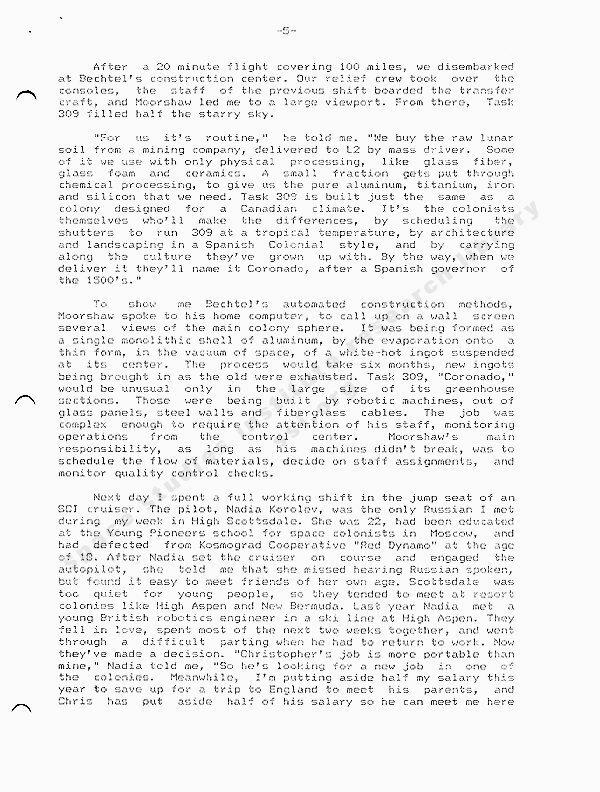 To show me Bechtel’s automated construction methods, Moorshaw spoke to his home computer, to call up on a wall screen several views of the main colony sphere. It was being formed as a single monolithic shell of aluminum, by the evaporation onto a thin form in the vacuum of space, of a white-hot ingot suspended at its center. The process would take 6 months, new ingots were brought in as the old ones were exhausted. Task 309, “Coronado,” would be unusual only in the large size of its greenhouse sections. Those were being built by robotic machines out of glass panels, steel walls and fiberglass cables. The job was complex enough to require the attention of his staff monitoring operations from the control center. Moorshaw’s main responsibility, as long as his machines didn’t break, was to schedule the flow of materials, decide on staff assignments, and monitor quality control checks. For the next six hours I kept quiet and watched a professional at work. Nadia’s task was joining the main subassemblies of SCI’s newest power satellite. Each had a mass of over a thousand tons, and it had to be moved and slowed in exactly the right way to arrive on location just as its speed bled off to zero. Nadia played the cruiser’s drive and mass, its many arms, grabbers and attitude controls, against the sheer bulk of each mile-long piece. Every move was made with the help of her laser velocity meters and onboard computer. She stopped for a sandwich lunch with me after three hours, but except for that she worked hard, totally concentrating for the whole shift. As we return to Scottsdale she told me that the new power satellite, already sold to Brazil, would be ready for checkout and the half-year year delivery trip in about three months. Carlo Silvestri, proprietor of Silvestri’s on the path that the Scottsdale people call the “High Corniche”, has built up a flourishing trade by a combination of good food, fine wines and his own personality. His logistic problems, I learned, were curiously different from those of a restaurateur on Earth. Over cocktails in the late afternoon he told me about them. “First of all,” he said, “You have to understand the huge difference between the prices of domestic and imported wines. I am part owner of Sweet Water Vineyards, right here in High Scottsdale. We make very good wines, there’s never a bad year, and I can sell at reasonable prices. But if a customer insists on a wine from California or France, I have to point to the right side of the wine list first or I’ll have trouble later.” Silvestri spends over four hours every day, starting early in the morning, visiting every nearby colony that grows fine meat or produce. He returns with the refrigerated lockers on his spacecraft crammed with the best selection. He buys fish and lobster mainly from Grand Bahama, a colony only ten minutes flight time away. But the Japanese of Minami Io Shima provide the best shellfish in the colonies, so he must stop there every day. After the interview, when Silvestri’s was getting crowded and the noise of conversation picked up, I had my dinner on the terrace. Steak Diane, some excellent fresh vegetables, and a local cheese, all with a bottle of Sweet Water Vineyards’ 2015 Cabernet. Carlo also buys from Alice McEwan, who runs a family farm on High Scottsdale with the help of her 18-year-old son Kevin. Alice got her degree in Agricultural engineering from the University of Arizona at Tucson, and emigrated to Scottsdale ten years ago after a divorce. Kevin’s father emigrated to another colony five years later, and Alice feels that the move helped both parents to do a better job raising Kevin. Before, travel costs to the Earth had made annual trips impossible, so Kevin and his father had only been able to keep in touch awkwardly and unsatisfactory by videophone. Now there are frequent weekend visits and occasional father/son trips of exploration to distant colonies. Kevin checks the inter-colony fares, and watches for the discounts that come when colonies in different orbits are at positions that allow quick trips and low fuel burn. Alice and Kevin operate a farm like nothing I ever saw on Earth. It is in one of the agricultural rings, a ten minute walk from Alice’s home on the Middle Corniche. There she monitors temperature, humidity, soil acidity, soil water and trace element content and other variables, for plots of land separated by glass walls along the ring. Her farming area is surprisingly small, a total strip only 20 feet by 200. “But don’t let that fool you,” she told me, “We keep the day length at 19 hours, we use a high carbon dioxide concentration for rapid plant growth, and we get six crops per year. Our yield is 80 pounds of produce per square foot per year, and Carlo wouldn’t buy from us if the quality weren’t high.” When we visited the ring, Kevin was reprogramming the weeders, animal-like little robots that scurry over the dirt looking for plants that don’t have the right height or leaf pattern. Because colony soil begins with no pests, and only the soil bacteria deliberately introduced, Alice never has to use insecticides. But she’s careful never to show her farm to a visitor from Earth until he has showered and put on one of the sterilized suits that she keeps on hand. Curt and Jack picked me up at the Scottsdale Inn, and got me settled in a small, comfortable compartment of their lander. We grounded on the Moon 39 hours later and suited up for the EVA. The parallel line of mass-drivers stretched for more than five miles along the edge of a lunar cliff. Each machine was 800 feet long. “They’re based on the Mass-Driver 3 design,” said Curt, “first proven by the Institute nearly forty years ago.” In the silence of the lunar vacuum I watched sunlit streaks appear once per second, each a payload of lunar material leaving the muzzle of a mass-driver for at over 5,000 miles per hour to begin the long 60-hour climb to L2. Jack stood by, ready to rescue Curt in case of accident, as Curt picked his way over the debris near the far end of #275. It took three cautious hours before he located the fused circuit breaker, and another hour to cut the circuit safely. Then we returned to the lander, and from there Curt and Jack programmed the maintenance robots to clear away the wreckage. The next day the job of reconstruction began. As our ship lifted off we glimpsed a swarm of robots at #275, patiently following the work program that Curt and Jack had laid out. So ended my brief study of the professionals of High Scottsdale. Ship captain, construction boss, heavy equipment operator, farmer, restaurant proprietor and troubleshooter. Six men and women who find satisfaction in their jobs and their homes on The High Frontier.